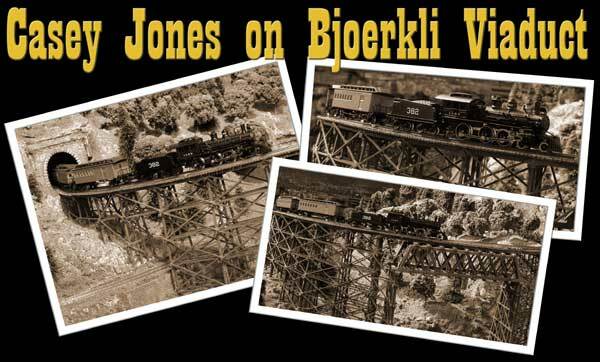 Finally I have taken some new pictures from the big bridge on the layout, the Bjoerkli Viaduct. Other pictures you have seen, is 10 years old, so with my new Märklin Casey Jones trainset, it was time to take some more pictures. Here you can see the steamengine and 4 passenger cars, crossing the bridge. The engine is very nice and have a lot of details. 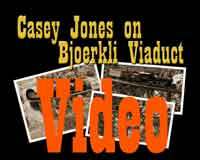 Read more about Casey Jones and his train on Water Valley Casey Jones Museum pages. Casey Jones are just entering main span on the bridge.